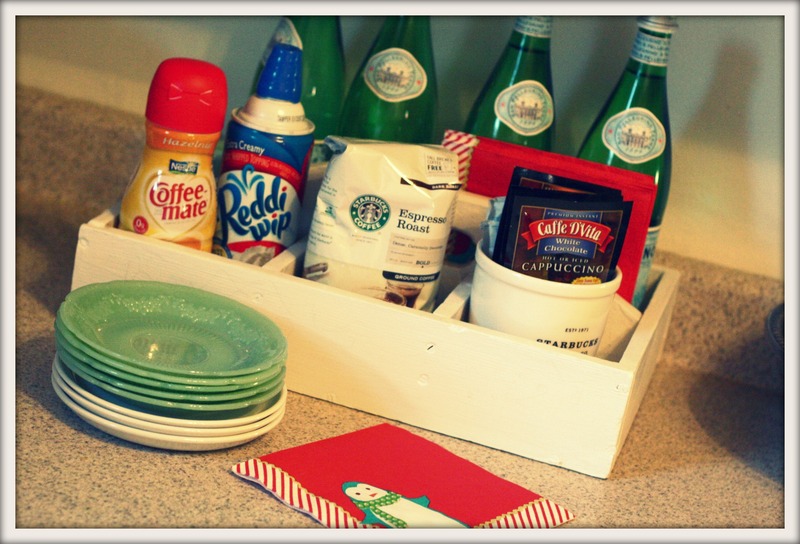 We had some fun family times here over Thanksgiving– I had a lot of fun making this drink for them. Easy, mixed drink. Special, without lots of cost-i-o-si-o. I make one drink at a time, in a mug. Here is the “recipe”, if one can call it that. This “recipe” makes 1 mug. -1/2 pack, your hot chocolate drink powder of choice. – a hefty slosh of White Chocolate Carmel Latte (flavored creamer). I`m sure other flavors would be good as well. I just had the white chocolate mudslide creamer. It is so good you should try that. Oh, FUN! I can’t wait to try this. We love creme de menthe. 2 c. half and half. Heat. Top with whipped cream. (It works better to heat everything except the milk until the york patties are dissolved and then add the milk). 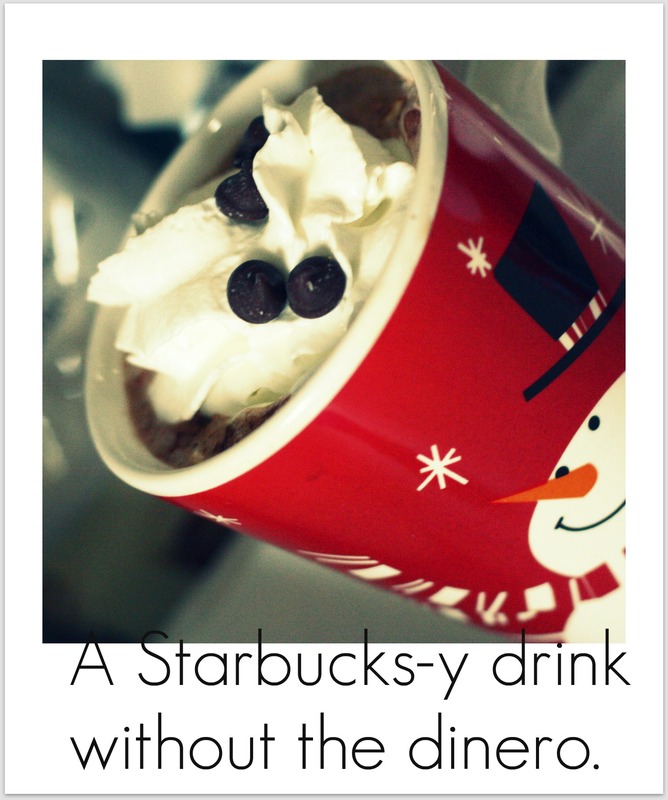 So creamy and satisfying and yummy and surprisingly like a peppermint mocha from Starbucks. 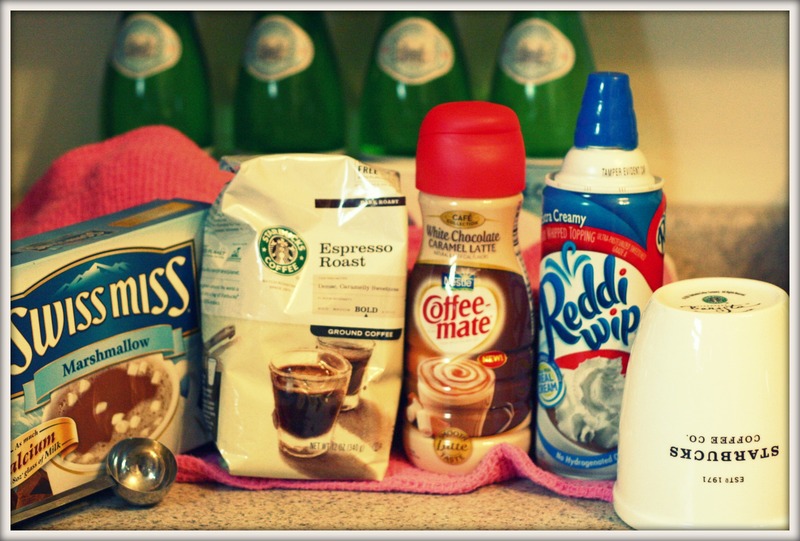 One that I love to drink esp in the winter is, make a really good kind of Hot Cocoa I like to use Ghirardelli, then add a squirt of flavored Syrup I like to use Monin Toffee Nut, another good flavor is hazelnut, or white chocolate. Then top with homemade whipped cream mmm yummy! This is a great drink if you don’t want any caffiene if you do add a shot of espresso!! oh!! i will be right over so that you can make me one of these!!! but, since i just received your very lovely!!! Christmas card in the mail today, i feel like i could use a Jenny-fix. this drink….we will definitely be trying!! 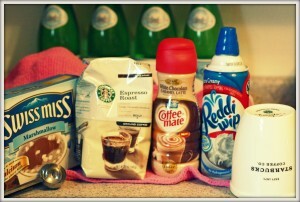 i am going to be running to the store to get that creamer and whipped topping. it’s a starbucky-s drink emergency situation that we have here now!!! Yum, I’m going to have to give a few of these a try. This morning I made the kids my own version of a mexican hot chocolate. i have no idea how those yardsale ladies make it but it’s wonderful, they won’t tell me “izza secrrrrret rrrrezipeee” (somehow theirs is thicker and creamier) No set amounts here, i use a small saucepan fill with milk, add a couple spoons of sugar, a small amount of chocolate syrup, a dash of cinnamon or allspice – serve the kids, then add half a cup of strong coffee to mine.